BESM and other titles based on Guardians of Order's Tri-Stat system have become enormously popular, owing to the simple game mechanics and high flexibility. 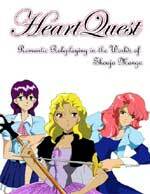 In addition to the main game and various sourcebooks, there are also compatible Tri-Stat adaptations of Sailor Moon, Demon City Shinjuku, Dominion Tank Police, Tenchi Muyo, El-Hazard, Slayers, Dual, Fushigi Yugi, and many others. For Links, please refer to my BESM links page. GoO's ever-increasing support of d20 system has led to the creation of a d20 system version, which radically changes the system to use Attributes and Defects similar to BESM. 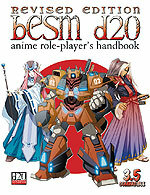 The basic rules of BESM d20 have been made available through the OGL, and there's an Anime d20 SRD available for download. GoO has also published several licensed titles using BESM d20, and released a d20 version of Uresia. d20 Resource Website: A collection of races, classes, attributes, etc. for BESM d20, and some extra stuff for standard BESM as well. This game, from R. Talorsian, is a fairly well-done adaptation of the BGC world, using the new Fuzion system. 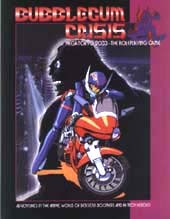 At present there is the main rulebook, which includes setting info, descriptions of just about everything and everyone included in the series, and a lengthy section with suggestions on how to make it playable, plus a "before and after" sourcebook that covers AD Police and Bubblegum Crash, as well as additional setting info and rules for cyberware. BGC is a part of R. Talsorian's "AnimechaniX" line, which also includes adaptations of Armored Trooper Votoms and Dragonball Z. 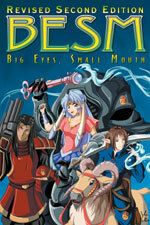 This title from Seraphim Guard is a Fudge-based game of roleplaying in the worlds of shoujo anime and manga. R. Talsorian's Mekton was one of the first anime-inspired RPGs, and remains one of the better mecha systems available today, especially with the addition of the Mekton Technical System (MTS) in the Mekton Z Plus sourcebook. 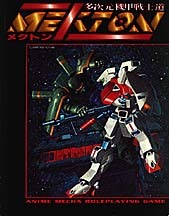 Mekton Z ("zeta") is the most recent (third) edition of the game. More recently, a new company called Atomic Rocket Games has been passed the torch for development of new Mekton titles. MektonZeta.com: The Mekton Z resource site with news, info, resources, links, and more. Virtual Mekton: A campaign setting for Mekton Z.
Infernal Funhouse Productions puts out this fairly obscure but interesting universal anime RPG, a bit crunchier than BESM. It's very difficult to find other than buy ordering it direct from their website, but it looks like a pretty neat game overall. (Just skip the appendix. No, I'm not joking -- just skip it completely and you'll enjoy the book a lot more). Dream Pod 9 is the publisher of several different lines, including the mecha games Heavy Gear and Jovian Chronicles, and once upon a time they put out a Project A-ko RPG (now out of print). Silhouette Core is the generic version of their house system, and the newer versions of their game settings are written as worldbooks that work off of the core rulebook. Although not anime per se, they've also put out a super-epic space opera setting called CORE Command. If you've ever wanted to run a romantic comedy game in the same vein as Urusei Yatsura, this is the game for you.